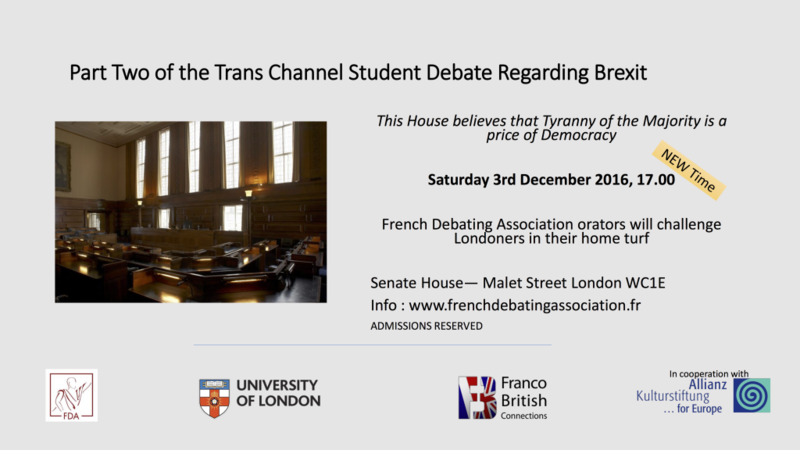 Please find an invitation from the French Debating Association for the second part of the Trans-Channel Student Debate on Brexit. In cooperation with the Franco-British Connections and the Allianz Kulturstiftung, we are organising a debate in the beautiful and prestigious Senate House of the University of London. During this event, four lucky FDA students will debate against four of their English counterparts around the motion “This House believes that Tyranny of the majority is a price of democracy“. Will the French prove to be more persuasive than the English in their home turf? Pack your bags, hop on the Eurostar, and come find out! More information on the French Debating Association website.